The above plant is one of my most treasured. No only is it a rare reverse cross intersectional hybrid of which there are only a few in existence world wide. More importantly, it is from a cross between a Japanese tree peony and a herbaceous peony. To my knowledge it is the only intersectional hybrid peony of its type in the world. 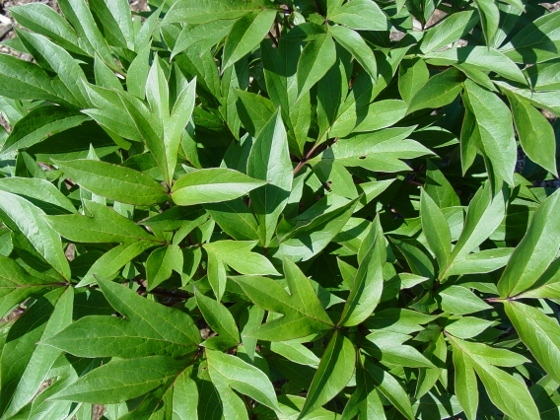 The seed parent was a white double Japanese tree peony (suffruticosa variety Stolen Heaven). The pollen parent was the pink single herbaceous (lactiflora) peony, Martha W. The cross, therefore, is (suffruticosa x lactiflora). As a result, it has no lutea genes in its generic make-up and thus no genes for yellow flower color. This plant bloomed for the first time in June 2003.